Isidore of Seville (599-636) wrote probably the most famous and important encyclopaedia of the Middle Ages, the 'Etymologies', named after one of its constituent chapters. It is a compilation of all the knowledge that was available to Isidore, from a wide variety of sources. This manuscript was written at St. Augustine's Abbey, Canterbury, and remained there for several centuries. 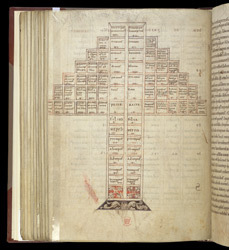 A Tree of Consanguinity is a representation of relationships by blood (as opposed to relationships my marriage), which allows one easily to see how many degrees of separation there are between two blood relatives. Marriage within seven degrees of separation was not allowed until 1215, when the number was reduced to four. From the middle of the tree the boxes are labelled Father, Grandfather, etc. (upwards) and Son, Grandson, etc. (downwards), with maternal and paternal uncles, aunts, etc. spreading sideways.